Hurricane Harvey forced the shut down of a number of US Gulf Coast refineries, impacting gasoline and oil prices. AFP/Getty Images photo by Thomas B. Shea. Oil prices took a healthy jump on Thursday, rising almost 3 per cent and gasoline futures soared 10 per cent as almost one-quarter of US refining capacity remains offline. US WTI crude futures recovered some early-week losses. By 5:55 p.m. EDT, WTI was up $1.27 to $47.53/barrel and Brent crude rose $2.03 to $52.76/barrel. US gasoline futures have risen about 25 per cent from last week to a two-year high over $2/gallon. 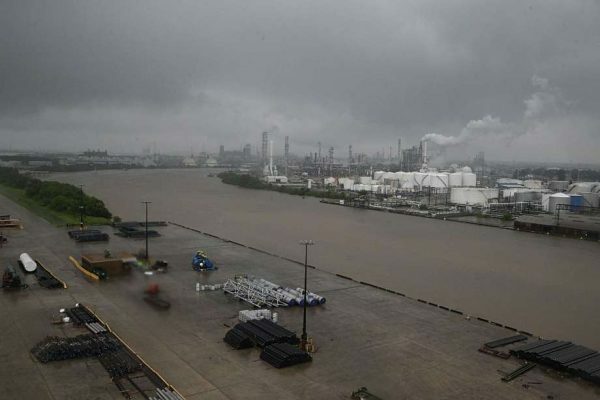 Hurricane Harvey’s deadly swipe at the Texas coast has impacted Gulf coast refining, shutting down about 25 per cent of the US refining capacity. Harvey comes days prior to the Labour Day weekend, typically a time that sees a surge in driving. Gasoline was up 21.03 cents, or 11.2 per cent to $2.095 at 1:53 p.m.
On Wednesday, the US Energy Information Administration reported a drop in US crude stocks by 5.39 million barrels, leaving inventories at 14.5 per cent below record levels seen in March. OPEC’s production also fell this month by 170,000 barrels per day (b/d) from a 2017 high, according to a Reuters survey. Unrest in Libya cut supplies and some cartel members boosted their compliance with the OPEC supply cut pact. According to analysts, the status of US refineries following Harvey’s destruction could be a key to oil prices going forward. “We could see rising U.S. crude inventories in the next couple of weeks until demand from refineries recovers. But by the end of September I expect the situation to be almost back to normal,” Frank Schallenberger, head of commodity research at LBBW told Reuters. Reuters reports Goldman Sachs and Stifel analysts expect US infrastructure outages to last several months, but add it is difficult to accurately estimate the damage. Falling oil stocks and expectations of increased global oil demand have resulted in a number of analysts polled by Reuters raising their oil price forecasts for the first time in six months. Weather officials are now tracking a developing storm, dubbed Hurricane Irma, brewing in the eastern Atlantic ocean. Irma, recently dubbed a category 3 hurricane, could hit the southeastern coast of the United States during the second week on September. A European weather model shows Irma gaining strength, clipping the southern end of Florida and then heading into the Gulf of Mexico where it could impact Texas.